You're concerned about the environment. You want to spend less on gas. But you want the power and cargo capacity that comes with a crossover. You can't have the best of both worlds. Or can you? Presenting the "un-hybrid," the Kia Niro. Kia has outdone itself with this model. It's roomy, comfortable, full of entertainment and safety gadgets, versatile and, best of all, budget friendly. Read on to discover everything that's new in the 2018 Kia Niro, then click the button to schedule your test drive at Southern Greenbrier Kia. Plus, get the Southern Hospitality Buyers Program with a lifetime of benefits; such as oil & filter changes, VA state inspections, loaners and much more. The 2018 Kia Niro embodies the old saying "you've come a long way, baby." The Niro has achieved what other "green cars" before now had not; it's not only affordable, but it's a crossover. The Niro gives drivers the option of enjoying the efficiency of a plug-in hybrid vehicle and the flexibility of a gas engine. To make the Niro even more exciting, add to the mix a regenerative braking system, which charges the battery anytime you decelerate, and a 6-speed dual-clutch automatic transmission with Sport Mode. The interior of any car is what defines it from the rest of the pack. After all, it's more than just a cabin. It's where you're going to spend a lot of time, so it needs to be a relaxing environment. The subcompact 2018 Kia Niro has above-average front and rear legroom, heated steering wheel, a 10-way lumbar support driver's seat, heated and ventilated front seats, and so much more. Another area where the Niro will astound drivers is in its connectivity and entertainment. You will command more than the road with UVO, Kia's free infotainment system. You can send and receive texts, access your favorite apps, connect via Apple CarPlay™ and/or Android Auto™ and do it all via voice-activated technology. ✓ Maximum Cargo Volume of 54.5 cu. ft.
Kia engineers all its vehicles with passengers' safety above all other concerns and amenities. From reinforced chassis for excellent rigidity and body integrity to intelligent engineering sensors to help drivers be aware of what's going on 360 degrees around the vehicle… and beyond. The Insurance Institute for Highway Safety (IIHS) gave the 2018 Kia Niro its highest rating of Top Safety Pick +. The Niro received a Good rating in all categories and a Superior rating in Front Crash Prevention. Every Niro is equipped with active safety technologies which give the vehicle advanced instincts and enhanced control. These functions will automatically aid the driver in keeping to the track. For example, the Anti-Lock Brake System helps reduce skidding and the Vehicle Stability Management offers increased control in harsh road conditions. 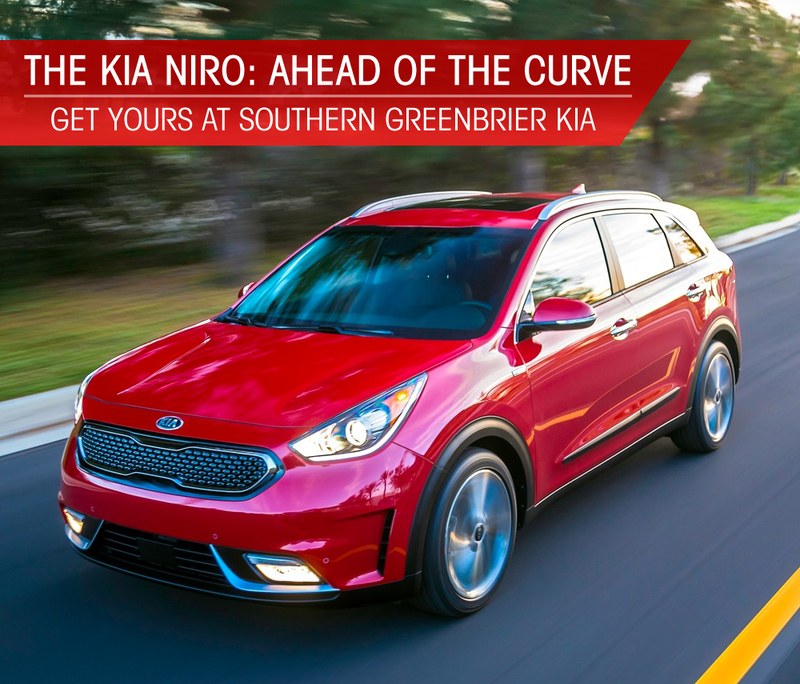 Now that you have read why the 2018 Kia Niro is perfect for Chesapeake, and the surrounding area, stop by Southern Greenbrier Kia and test-drive one today. Don't forget that every vehicle comes with the Southern Hospitality Buyers Program.